Winning gift cards is always fun because you get to choose what you want to buy. We are helping to promote this giveaway from Drugstore Divas as she teams with some of the best bloggers to give away these lovely gift cards. 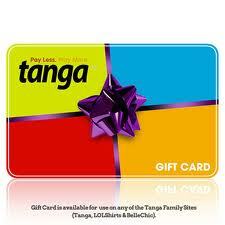 There will be two (2) winners and each winner will win one (1) $50 gift card to Tanga.com. If you're unfamiliar, Tanga is an online store that sells everything from rings to magazines. There are daily magazine deals and today's is Readers Digest magazine for only $3.99 a year. That's 86% off retail, which is awesome. The giveaway starts today, July 11, 2012. It goes until 11:59pm on Saturday, July 21, 2012. Winners will be emailed to the email address used in the Rafflecopter form. The winner will have 24 hours to respond before a new winner may be selected. Good luck! A discount price on Diamond Candles or The Hidden Treasures Candles! definately more board/card games and diamond candle or those other hidden treasures candles at a cheaper price!